TELEVISION AND TIKI – two phenomena that appeared in American pop-culture at exactly the same time. As the A-frame and gas torch were sprouting on the urban landscape in the 1950s, the TV set was fast becoming a new member of the family at home. Armchair voyagers and would-be beachcombers could enjoy a round-trip ticket for the imagination via the glowing tubes of the magic box. 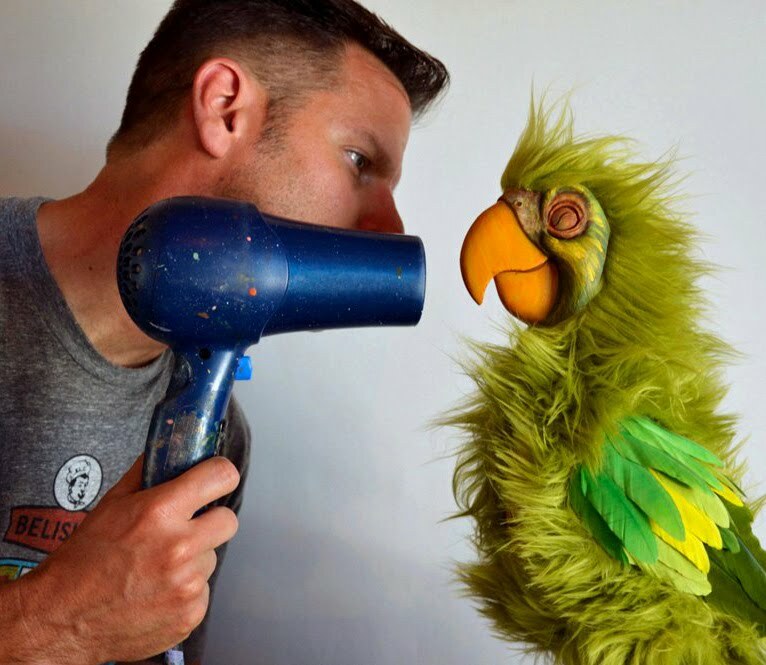 Behind the scenes, the designers and movie magicians of Hollywood were busy turning studio backlots and the surrounding hillsides into the tropics. Artificial blue lagoons and lush gardens were fabricated on indoor soundstages, and Los Angeles’ burgeoning Chinese and Filipino communities were called upon to portray the exotic inhabitants of faraway lands – both real and imagined. 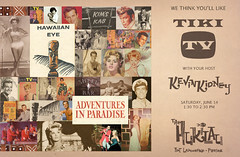 Join artist Kevin Kidney for a highly entertaining hour of vintage televised Tiki Style through the seldom-seen classics ADVENTURES IN PARADISE and HAWAIIAN EYE. Often glamorous, always stylish, (and sometimes really hokey) clip highlights from the shows themselves guarantee this to be the most fun you’ll have watching TV in a long time! Wow; that photo of Connie Stevens is beautiful. Can't wait to see clips from the show, which I've long heard of but never seen. Hey, I'm just now realizing: is this a presentation that's only given at the Hukilau, or can I watch it on the Net? I'd go...but when I came back I'd probably find the locks changed. This is too important a piece of pop culture history to simply let it evaporate after your presentation ends. If you could figure out some way to get your presentation online, it would be greatly appreciated. Really wish I could be there!!! Can't wait for the recap! I've just scrolled through your lovely blog and I love your work! That Tiki cover is stunning. 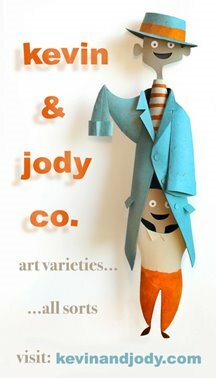 Glad to have found a fellow paper sculptor! I have very similar inspirations. Maybe it's our animation business background. I'm so glad that symposium in music has had a resurgent in interest. I think people are responding to tangible art since there is so much CG art out there. Take Care! One other thing....how weird is it that we both have organs for last names? croz! I wish you were here with us, too! You'd have such a great time. We'll recap the highlights when we get home. Hi Megan! Thanks for your terrific comments. I love your work, too - You are SO inspiring to me. I wholeheartedly agree that handmade art and imagery is making a bit of a comeback. To know that something was made on a computer diminishes a lot of my curiousness on how it was made, yet I still MARVEL in awe at people who sculpt, draw, paint, sew, whatever, the old-fashioned ways. Paper sculpture has long been my personal favorite choice of expression, probably since designing theater sets in college. Also I like the low cost of the materials! I can't believe I'm just finding out about this fab event now that it's over. I am a huge tikiphile, and a twenty year collector of Martin Denny/ Les Baxter music. I have a house a few blocks from the MaiKai, and majorly raided their dumpster after hurricane Wilma caused alot of damage to the place. I usually take every visitor there for dinner. When I was in the corporate world I would set up job interviews at the Tonga Room and Trader Vics in San Francisco, just to see if the prospective hire was cool enough to get it(they usually weren't). As a co-host of New Yorks Dachshund Octoberfest, ( a 17 year weiner dog love-in in Washington Square park)I'm a great believer in building momentum over long periods of time. Why is this the last one?